Sensei Dalley is introduced by Sensei Malathi for her first teacher demonstration for our Study Group! Her second composition using leaves as and flowers as mass. The lovely arrangements that were done in the workshop following her demonstration. 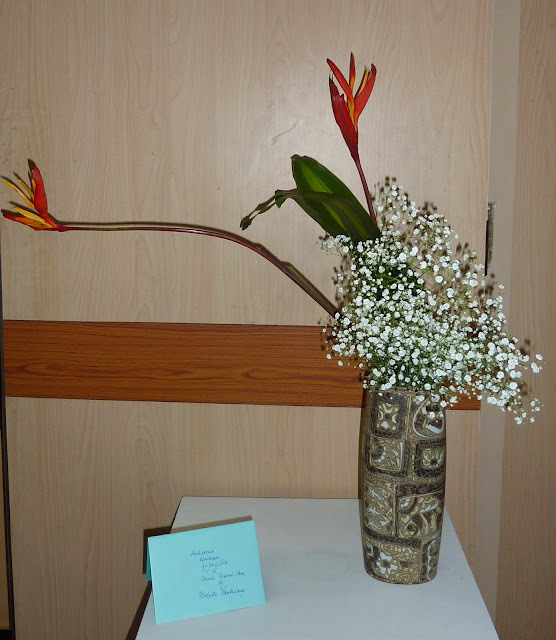 We also had two special guests at our workshop, courtesy prerana, and we had friendship through flowers with them, one of whom was a Sogetsu artiste from Pakistan! Sensei Valeria Raso Matsumoto and her group visited us from Auroville. She consented to give us a demonstration on "Techniques", and Dalley Verghese was our gracious hostess for a wonderful morning. Her daughter was a great assistant to her, not only to carry out the demonstration, but helped her by translating her words for us. Dalley had gone through meticulous arrangement to make sure we could all be accommodated. 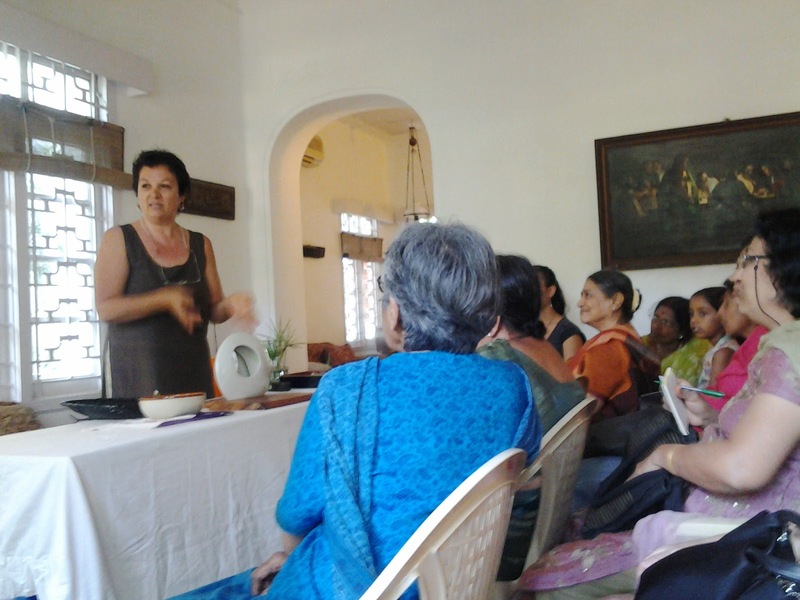 Members listened attentively as Valeria brought us many tips and nuances to add to our expressions. commend of the large and colourful contemperory ikebana seen everywhere! Valeria had interesting shapes of containers and it was remarkable how she had carefully packed them along with the leaves and other materials of her choice for the demonstration. She began with the white circular vase with an interesting opening. The pictures in this post are courtesy Meenakshi, Chelvi and Janaki, and were taken on their 'phones or tablets. the circular arrangement of the Umbrella Plant leaves looked dramatic in this composition, with the lavender of the flowers well framed against the white of the container. 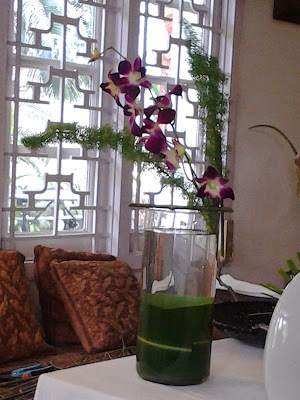 Dally had prepared the venue in her home for this event so beautifully and with superb taste, the event looked gorgeous. 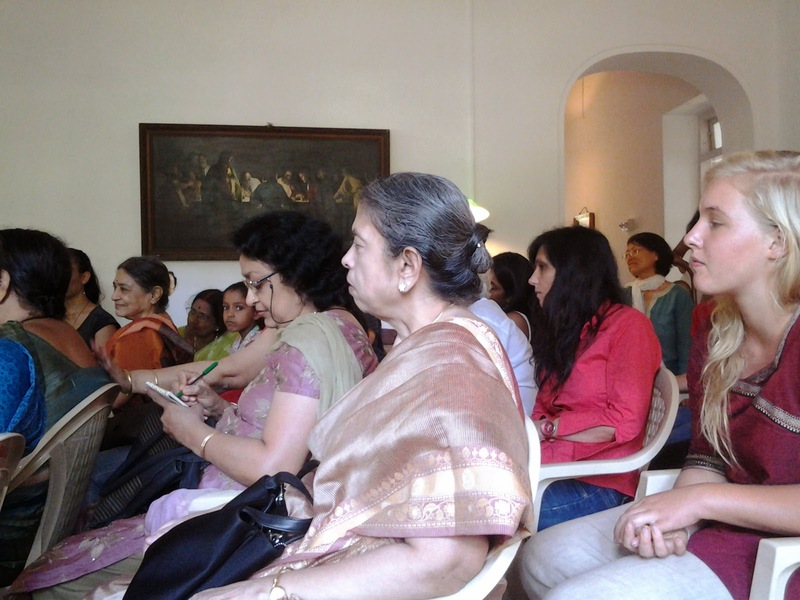 Meenu had organised the programme so meticulously, keeping an eye for details and the whole programme was superb! Thank you all for this wonderful effort.and a memorable morning. 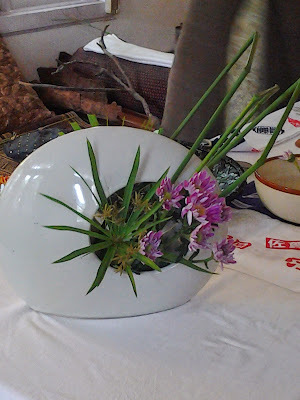 Valeria shared her interesting technique of fixture for glass vases by which you can enjoy a clear vase in case you dont want the stalks to be seen. Another of her creative expressions, once again with ainteresting vase, dramatic lines and a clear colour focus. 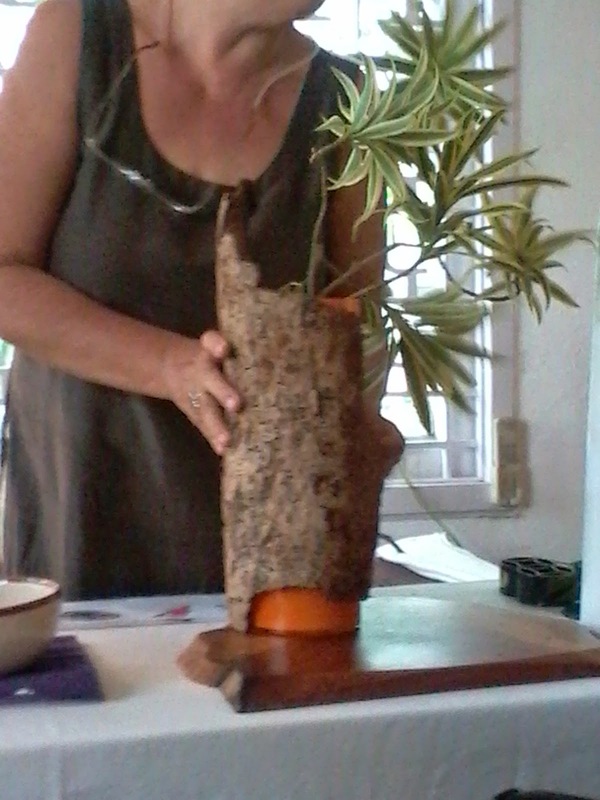 With this creation, Valeria demonstrate an interesting effect of using a tree bark on a vase. It added wonderful drama to her composition. 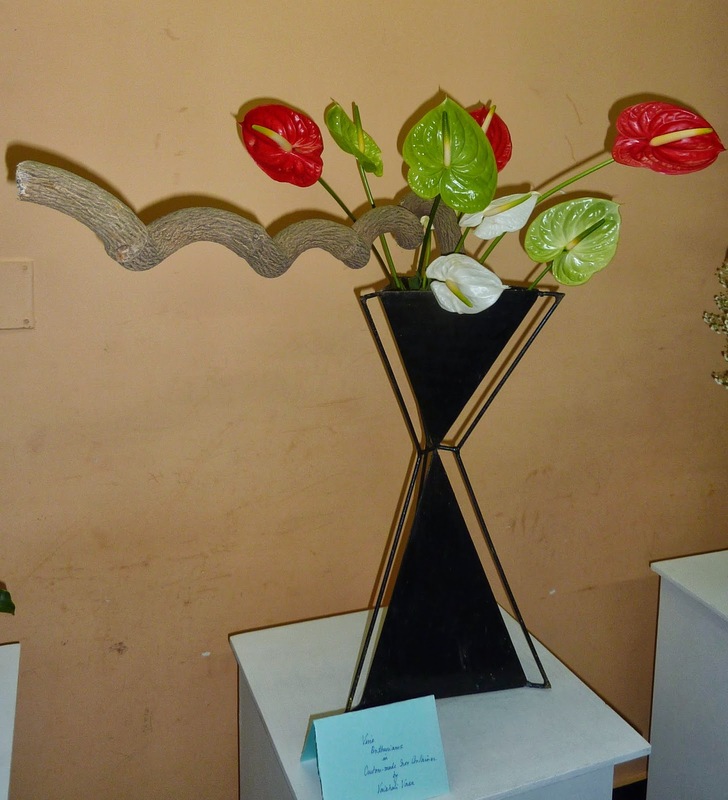 She ended with this piece, where she demonstrated the use of repeated forms in an abstract theme. Please note the beautiful base she displayed her piece on. The photo captures the wonderful fellowship with flowers that we enjoyed! Our members then created their own freestyle compositions, and Sensei Valeria gave her valuable comments on these. Unfortunately, we don't seem to have pictures on these. 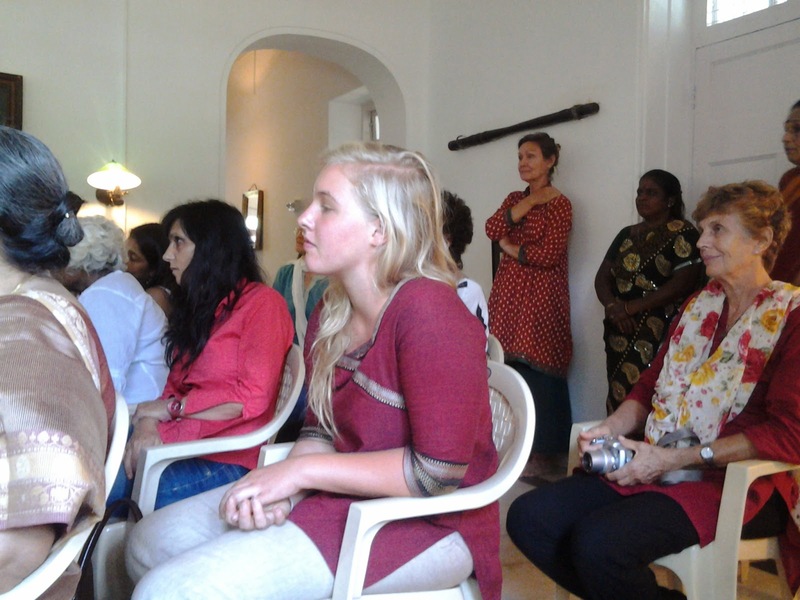 Valeria drove from Puducherry along with 9 of her students, some of whom we had already met and so we renewed our friendship, and were very happy to meet the new students. 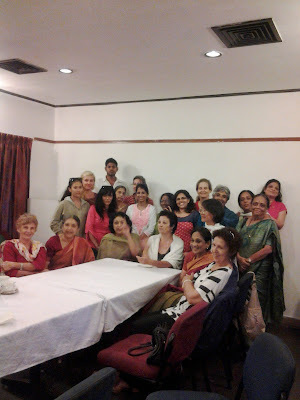 We had lunch at the Presidency Club and we thank Trishala for organising this. 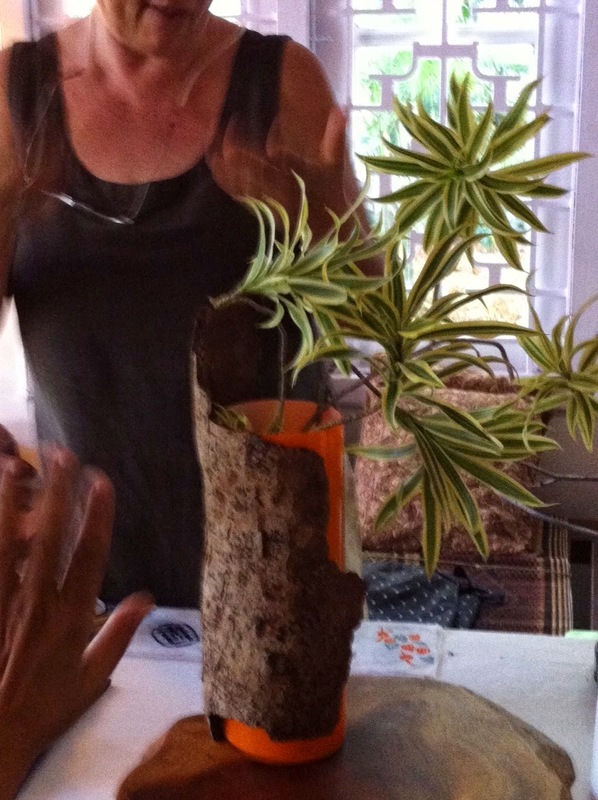 Later Valeria and her team drove to the ikebana exhibition by our members and then returned to Auroville. 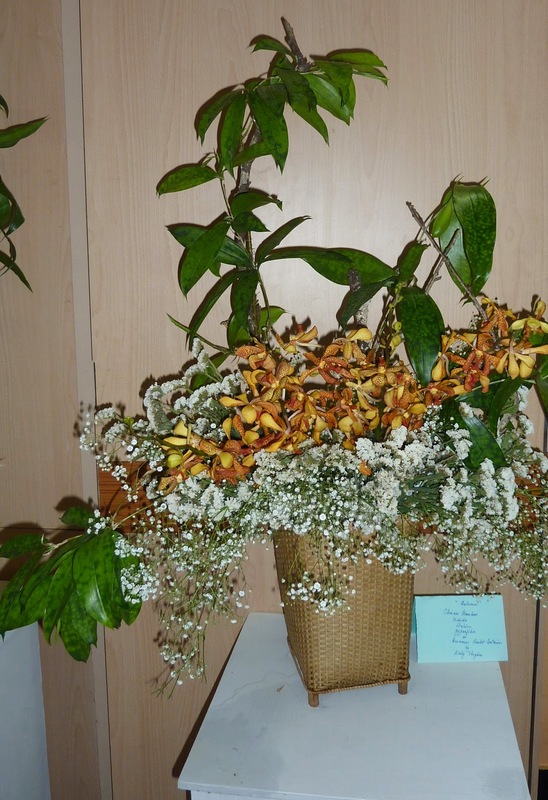 ABK AOTS Dosokai had their annual Japan Festival between Friday 21st March and Sunday 23rd, at their own premises on Nelson Manickam Road. 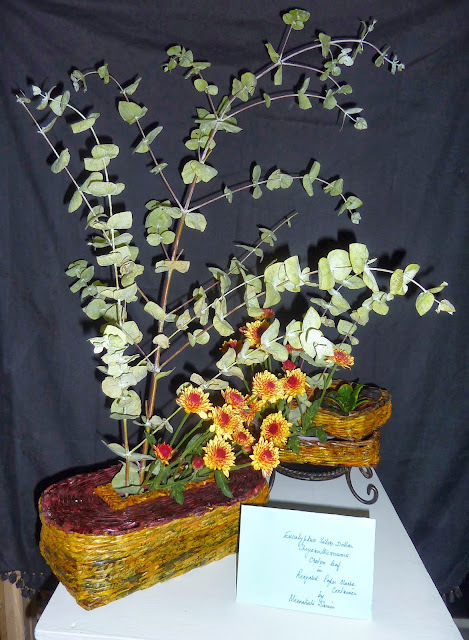 The Sogetsu Study Group was happy to participate and display Sogetsu Ikebana along with the Japanese dolls, origami and Bonsai exhibits. There were also Judo demonstrations to attend as part of the festival. 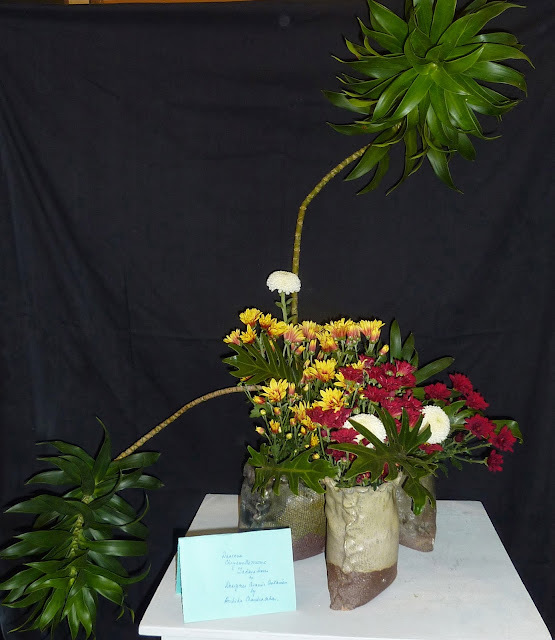 All of us assembled on the evening of the 20th to put up our arrangements, and since we each had to do just one piece, we were done fairly quickly! Here are the pieces we did, in no particular order. For some of them, the wall or the curtain worked as a good background. 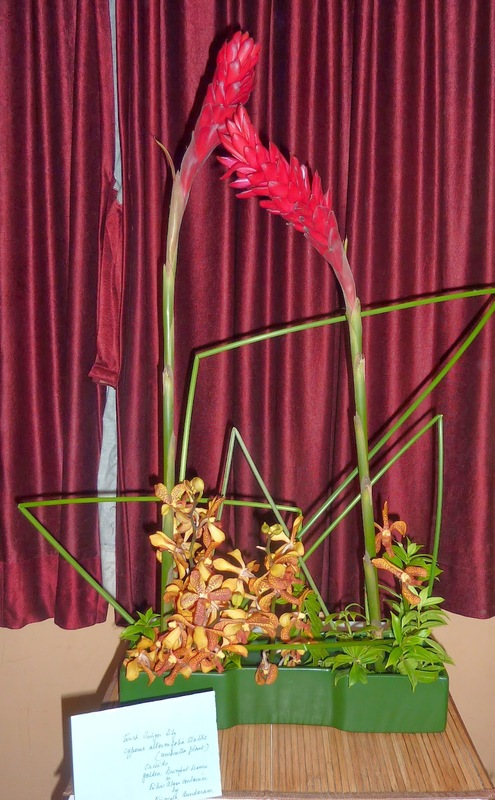 For others, we tried to use a black cloth background to highlight the arrangements. This is one area we need to improve upon - our photography and recording of our work, giving more focus on the lighting and the background. Pushkala's arrangement. This picture taken on the second day, once the lilies began to open. 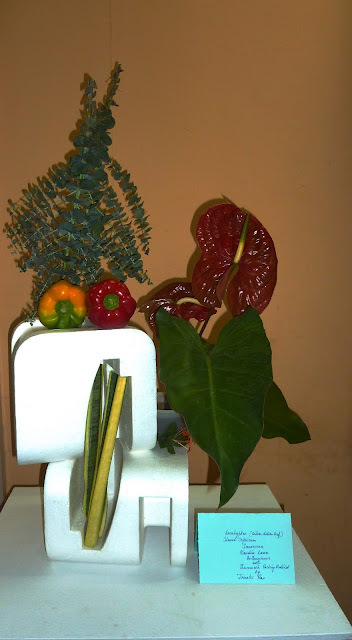 Janaki works an abstract theme, with thermocol. The capsicums add colour! 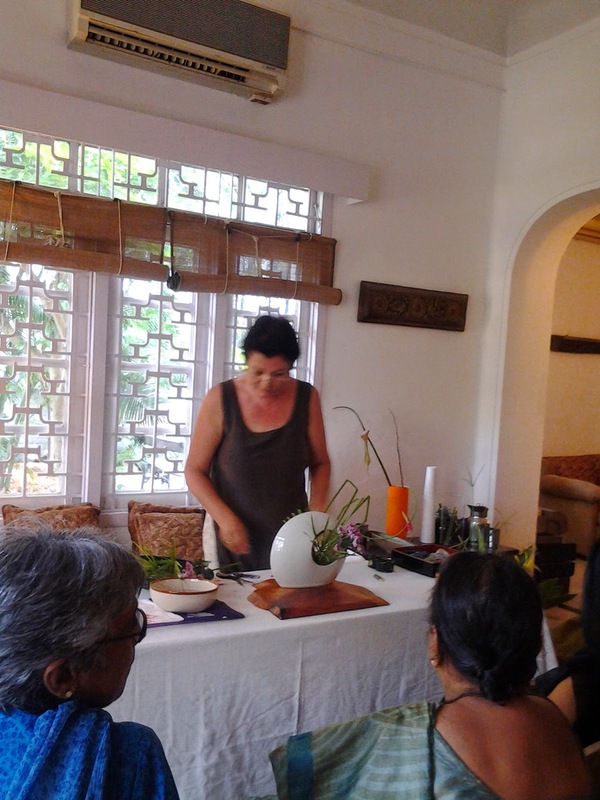 Sensei Vaishali's bold wrought iron custom-made vase added drama and vibrancy to her creation. 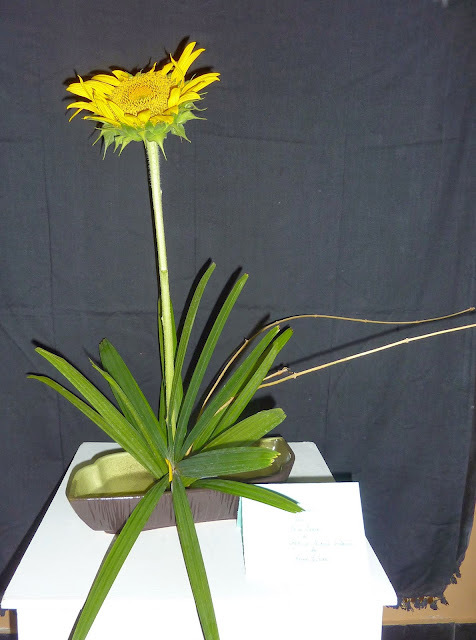 Divya used a sunflower to create a bold and contrasting moribana. 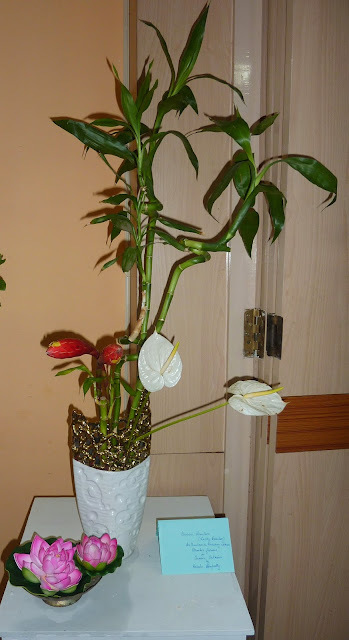 Sensei Meenakshi worked with recycled papier mache containers. 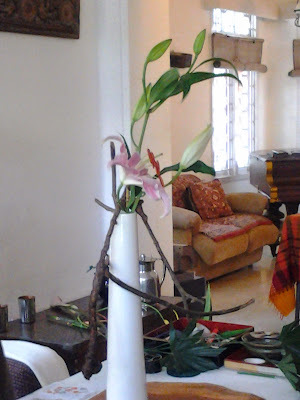 Seethalakshmi's creation, done in absentia by Chitra! Nirmala experimented with geometric lines in her composition. Sensei Meenakshi used the local Tulip tree blooms for this composition. 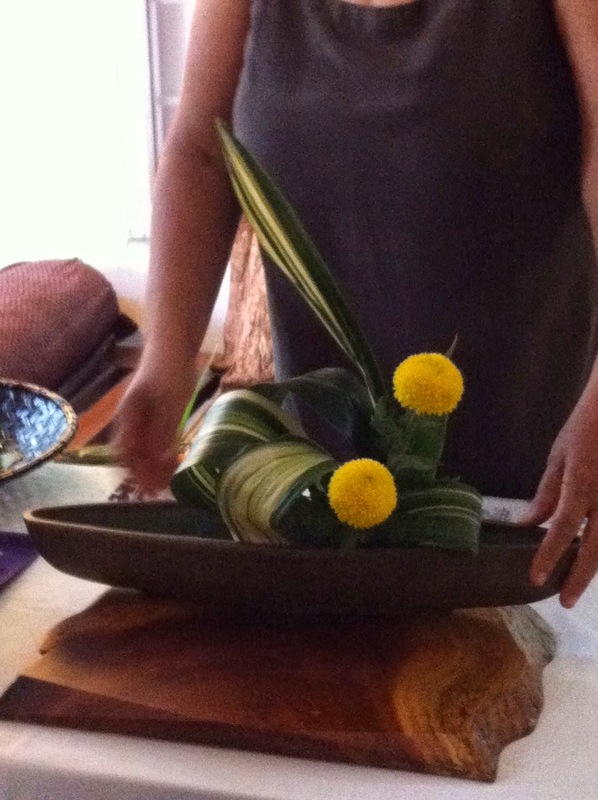 Trishala created a fish path moribana, highlighting the vase as well. And now, we steel ourselves for the Chennai summer, and look forward to gathering again once the mercury falls!